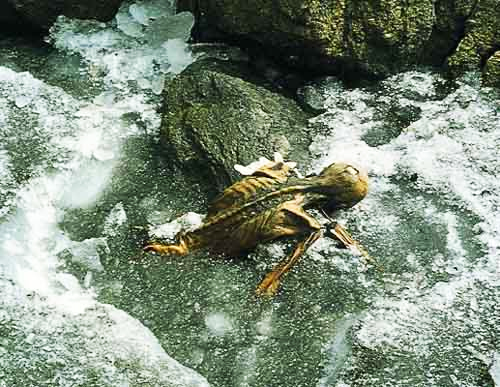 Did Billy Meier or Plejaren really predict the cause of death of 5,300 year old Ice Man (Ötzi) by ARROW in 1991 - even before the discovery of the Ice man was made in the Ötztal Alps on the Austrian–Italian border, on September 19, 1991 - when scientists only discovered this fact in July 2001 ? The answer according to Billy Meier supporters and FIGU members is an unequivocal YES! According to Michael Horn, Meier’s American media representative - "many examples of Meier's specific, prophetically accurate information are ironclad, based on copyrights establishing his publication of the information long before "official discovery" and that this is the "higher standard of proof"." And among these many alleged examples of prophetically accurate information, the Ice man corroboration, according to Meier supporters & FIGU members was alleged to be one of the top most examples for the strongest corroboration with the most irrefutable evidence (publication dates on the copyrights page of the book). It was often invoked by pro-Meier camp during discussions or debates in several online forums as a way to settle any doubts or attacks that araise from the critics or skeptics on Meier's or ET's prophetic abilities. The lack of an assured rebuttal from a professional skeptic Derek Bartholomaus, a member of the Independent Investigations Group (IIG), on his website (where the 'Coming Soon' notification on the Ice man deconstruction have been there for years) further supported pro-Meier camps' claims. See the following excerpt from a lecture given by Michael horn on the corroboration of Ice man, during the 17th annual International UFO Congress (IUFOC) held between February 23 - March 1, 2008. So we ask again: Should Billy Meier be awarded the $1,000,000 prize for "his" prediction on the death of 5,300 year old Ice man - Ötzi, as suggested by Michael Horn ? Let us "put our thinking caps on" & "start to think like detectives" as Michael suggests in the above video. What evidence did Michael Horn provide to support his claims ? Scans of the cover page of Semjase-Kontakt-Berichte volume 13 (SKB 13), copyrights page with the publication date as 1996 & the text with ARROW (or 'Pfeile' in German) part in verse 574 in the page no. 2539 of the book. Meier or others may have newly inserted the ARROW part into the text after it was discovered for the first time in July 2001 by scientists from the observation of Ice man's chest X-ray and CT scans. So, the scans of the pages from the alleged 1996 book of SKB 13, which Michael Horn provided on his web page, may actually have come from a newly printed book, published sometime after July 2001 discovery was made public, with the ARROW part inserted into it for the first time. How does one test the above hypothesis ? It is pretty easy! If we could find at least one Semjase-Kontakt-Berichte volume 13 book which was printed and sold since 1996 by FIGU, without any ARROW part in the text, then it will support the above hypothesis. "This, again, dismisses the last, dying breath complaint of the skeptics that Meier could have back-dated his material, which is obviously impossible, as many people have already long since discovered." Let us put the impossible to test! Following are the scans* of the book, SKB 13 with 1996 publication date just like the scans of the book on Michael's web page but without the ARROW part; just what is needed to test the hypothesis. * the owner of the book (who wants to remain anonymous) said that he doesn't remember the exact date but has purchased it certainly before the year 2000. See the verse 574 on page no. 2539, circled in red and which was supposed to have the ARROW ('Pfeile' in German) part in it, but is missing. 574. Sein Tod erfolgte damals auf die Art, dass er infolge eines epileptischen Anfalls abstürzte und sich verletzte, als gerade ein urweltlicher Eisnadelsturm ausbrach. This supports the hypothesis that: Meier or others may have newly inserted the ARROW part into the text after it was discovered for the first time in July 2001 by scientists and printed it in the new edition of the book sometime after the July 2001 discovery was made public, without notifying the readers or drawing any attention to it. But after noticing this anamoly, I corresponded with Michael Horn and FIGU CoreGroup member & SSSC Director Christian Frehner during the month of June 2014. Christian Frehner insists that the scans and the English translation which he made & sent to Michael on February 17, 2008 to be posted on his website, come from the book which was published in 1996.
subject: Re: Fwd: Re: Ice Man prediction anamoly? I did not buy the SKB, but received it when it was published. I don't know the exact date, but it must have been in 1996. How can the verse (no. 574) from the same page (no. 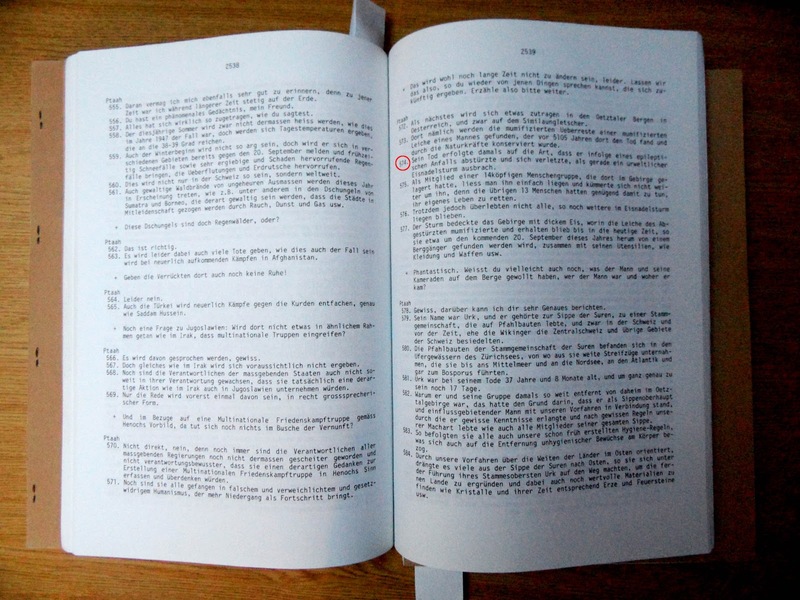 2539) of the same book (SKB 13) published in 1996, have different information (one with ARROW & the other without ARROW) ? Does the SKB 13, which Christian says he received in 1996, was specifically published for the FIGU Core Group (CG) members ? Some Meier supporters might argue in this way and could claim that Meier or Plejaren may have deliberately made this prophetic information available only to FIGU CG members. So the SKB 13 which you used to have was also from 1996. Still the main question remains! How can verses in the same page, same book published in 1996 have different information ? Your SKB 13 has ARROW but other SKB 13 does not. I don't think the SKB 13 which you received, was only meant for CG group ? Or was it ? Yes, that's a mystery. I don't know the answer. No, the copy of the SKB 13 which I received was the official one, for sale. There is no practical reason for FIGU to publish ARROW in some SKBs and not publish ARROW in other SKBs at the same time. And moreover as will be revealed below, it is not just the ARROW word that is different in Christian's SKB 13 to the various publications of the same verse 574, but other words as well, which exactly matches the verse published in the latest Plejadisch-Plejarische Kontaktberichte 6, in 2006. Below is the list of all publications (excluding the latest Plejadisch-Plejarische Kontaktberichte 6 published in year 2006; which does have the ARROW part) arranged in chronological order in which Meier has published the Contact Report 238 covering the relevant Ice man, Ötzi information. They all are identical (except the word 'Anfalls' was written in SKB 13 whereas in the rest, it was 'Anfalles'). And in none of these publications (respective scans of the pages will be provided in Part 4/4) was there a mention of ARROW, as the cause of death of Ice man. Sein Tod erfolgte damals auf die Art, dass er infolge eines epileptischen Anfalles abstürzte und sich verletzte, als gerade ein urweltlicher Eisnadelsturm ausbrach. Text from the verses 572 & 573 in the above images was published on page 11. But the text from verse 574 which is alleged to contain the crucial information on Ice man's death, was missing. On page 12, the article starts discussing on the information contained in verses 578-581 . 574. Sein Tod erfolgte damals auf die Art, dass er infolge eines epileptischen Anfalles abstürzte und sich verletzte, als gerade ein urweltlicher Eisnadelsturm ausbrach. Now compare any of the above similar verses with the verse 574 from Christian's SKB 13 (see below). Notice the words marked in red. These are absent in all the rest of the publications. And now notice how the verse 574 in Christian's SKB 13 is an exact match to the same verse, though with a different verse number 586 from Plejadisch-Plejarische Kontaktberichte volume 6. 586. Sein Tod erfolgte damals auf die Art, dass er infolge eines epileptischen Anfalls abstürzte und sich dabei mit einem seiner eigenen Pfeile rücklings schwer verletzte, gerade als ein urweltlicher Eissturm losbrach. 586. His death happened at that time in such a way that he fell caused by an epileptic fit –and was severely injured by one of his own arrows when he fell on his back, just at the moment when a primeval ice storm started. The verse 574 of Christian's SKB 13 is an exact match to the verse 586 in PPKB 6, which was published in 2006. This suggests that the SKB 13, which Christian had (currently he doesn't own it anymore), likely would have been published after July 2001 or 2004 - adding further support to the hypothesis. If Meier really had mentioned ARROW as the cause of Ice man's death before July 2001, then that would really be a good candidate for a fantastic prediction. And we would have seen corroboration articles drawing our attention to it. But the lack of any corroboration articles or any discussion or noise for that matter on this topic lends support to the above hypothesis. "..the most recent confirmation is nothing short of stunning, as the proof that Meier published it in dated, copyrighted form – long before the discoveries were made – is clearly and easily available". "This, again, dismisses the last, dying breath complaint of the skeptics that Meier could have back-dated his material, which is obviously impossible, as many people have already long since discovered. " "..even more important than Meier’s having first published the information about the discovery, in May of 1991, months before it occurred, is the irrefutable fact that he published specific information about exactly how the man died ten years before scientists discovered it using modern CT scan equipment." "Where Is the $1,000,000 Iceman?" Since almost all of the books published by Meier (especially contact notes) or FIGU members are self-published through their own publishing office, called as Wassermannzeit-Verlag (see the copyrights page above), there is no easy way of tracking any changes (adding, deleting, modifying,..etc) that were made or being made to their books. For whatever reason, there never was any effort to identify and publish these changes that the readers would come across among different editions of the same book. The only method to verify if so & so is a corroboration or not is to check each and every edition of the relevant book for the same text & observe if any important changes were made or not. Only some printing errors in the books published by FIGU members or Meier are mentioned in their corrigenda and in the bulletins online. And regarding the publication dates, one has to inquire at the public/private libraries or owners of the book about his/her purchase dates or check the invoices obtained from the purchase. Some people who are both FIGU and non-FIGU members seem to prefer superficial investigation and the promotion of any resulting evidence, as long as it is ‘pro-FIGU’, rather then to dig deep, ask critical questions and uncover the facts, which like in this case often reveal the evidence is not as ‘iron clad’ as it initially seemed. But instead of simply accepting the facts, the so called ‘neutral-positive’ attitude suddenly goes overboard and the person pointing this out is being attacked. Any attempts to discuss the actual investigation are met with an endless barrage of logical fallacies and personal insults, or simply by the twisted, shallow response: "It’s all about the spiritual teachings and the evidence is not important…"
If anyone of you has SKB 13, then please let us know the date of purchase and whether or not the word 'Pfeile' (ARROW) was published in verse 574 on page 2539 of the Contact Report 238. Since the evidence for one of the strongest examples of Meier/Plejaren's "prophetic" information, is now proved to be most likely not true, people sympathetic to the Meier case should ponder on rest of the alleged "specific, prophetically accurate information". This would be seen as a just another confirmation of their suspicion. According to them, it is nothing new as since the beginning, they have been claiming that all of the Meier's alleged prophetic and scientific information could be easily explained away by showing that his source for the prophetic or predictive information, he wrote in his Contact Notes was from newspapers, scientific journals and magazines, not ETs. We have just covered only a small part (one cause of death) of the information published by Meier on Ice Man, Ötzi. In the third part (part 343), we are going to analyse the following information published by Meier on Ice man's - original habitat, age of Ötzi , border dispute between Austria and Italy, age of Ötzi's corpse, other causes of death and the events leading up to his death. 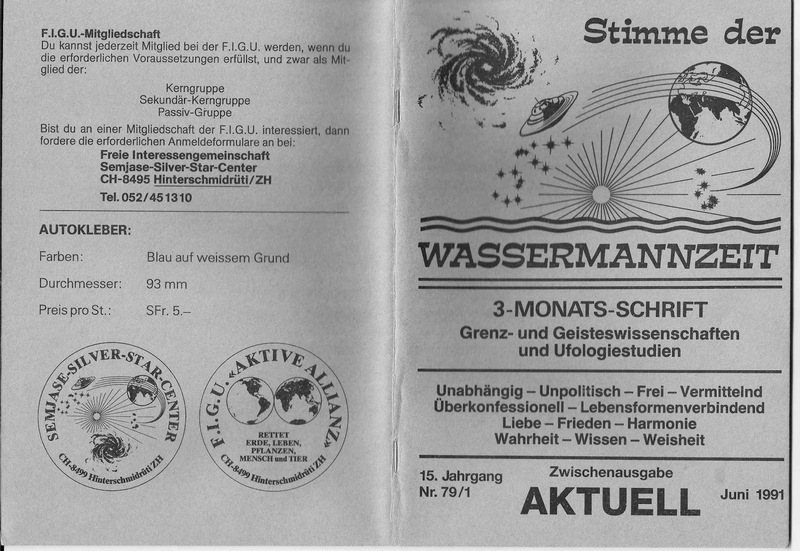 I forgot to address one more issue that has to do with the publication date of Stimme der Wassermannzeit, Nr. 79/1, Jahrgang 15, June 1991. 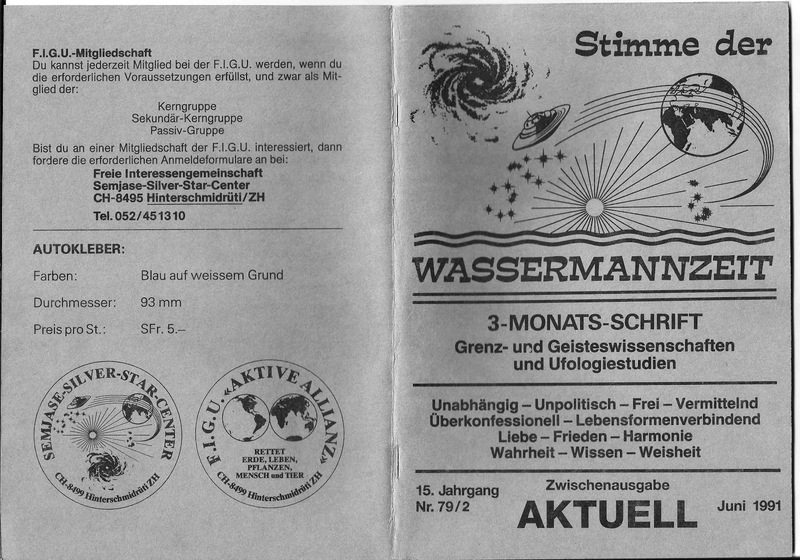 People who are not acquainted with the fact (and the possible consequences) that almost all of Meier/FIGU members books are self-published through their own publishing office, called as Wassermannzeit-Verlag, would notice that Meier has published the discovery of Ice man (without the ARROW information) in the June 1991 issue of Stimme der Wassermannzeit, 3 months before the discovery of Ice man's corpse on September 19, 1991 in the Ötztal Alps on the Austrian–Italian border. And they would argue that this discovery aspect at least proves the unusual source behind Meier, which we are unambiguously told are ETs. I will deal with this issue in Part 2/4.